Swinging the spotlight over on the recently released special editions of Secret of Monkey Island and Return to Monkey Island! 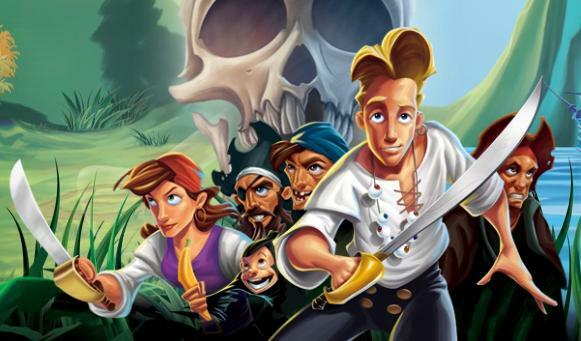 I just finished re-playing through Secret of Monkey Island, and I must say – what a fun time! The new graphics are fantastic, and the game has a nifty hotkey (It was F10 for me on PC) that takes you back and forth from new graphics to old 1990’s gameplay. There are lots of major upgrades, like a re-done soundtrack and voice acting added to the new game. As far as graphics go, I’m really happy with the way it was done. The game looked like a painting most of the time, and it kept with the same feel that I remember when I played this more than 10 years ago on MSDOS. A lot of things were also added, such as random skulls in the sky forming clouds and what not, but it didn’t take away from the overall feel of it, because it’s got the same art style we saw in Monkey Island 3: Curse of Monkey Island. 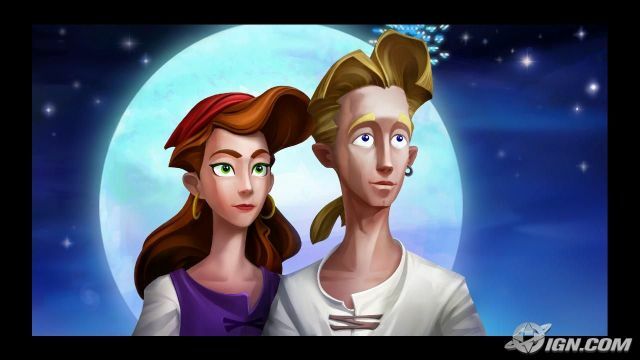 I know I’ve said it before, I find these Monkey Island games to be absolutely hilarious, and I’m very happy to see that LucasArts is bringing back the first 2 in the best way. It felt like I was playing the game for the first time again. The best part was, if I needed to remember something the old way, there was the hotkey. Another point, Monkey Island games have been cross-platform for a while, but I’ll mention it here anyway: The Special Editions are cross-platform! Now you can play them via PSN, PC..even your iPhone. I strongly recommend anyone reading this that enjoys a fun puzzle game every now and then to at least download the demo’s available for these new games! So game-wise, I’ve got a lot piling up on me. For one thing, I still need to finish playing the last 2 parts of the Monkey Island 5-part finale. The game is a total riot, but I stopped playing it because it was holiday season and I simply didn’t have time any more. Then, of course, the usual. You get out of the groove and it’s hard to get back. I’m concerned now because I’ve started playing a few games recently that I want to finish as soon as I can. That way, I will have my time free’d up for other stuff in the next month or so. The games I’m playing now? Final Fantasy XIII (PS3), Borderlands (Steam), Legend of Zelda: Phantom Hourglass (DS). I must say, so far FFXIII has been very disappointing. It’s beautiful, but I was hoping for more. Maybe later on in the game I’ll enjoy myself, but I hate that I have to play upto a certain point in the game (15+ hours, I’m told) before it actually gets interesting. It’s ~15 hours I feel like I got ripped off when I purchased the game. Borderlands continues to be fun for me, but I’m trying not to play it to death. If I sit in front of that game for hours, chances are I’ll just lose interest. I’m at a phase where it’s still pretty challenging, because I’m still low level and haven’t enough EXP to just blow through the missions. I’m also still really enjoying the artwork. As for Phantom Hourglass….holy epically long game, Batman! WILL IT EVER END?! Geeze… on the one hand, it’s great that it’s taking me so long to beat it, I’m saving money that I’d be spending on more DS games. On the other hand..I’m so ready to just finish the game and move on already. Apparently, there is such a thing as too long of a game (when it has an end, of course). What I’m dying to play when it comes out: Doctor Who! I’ve been watching the new series with friends, and they got me hooked. Now we found out there’s a free game for PC coming out in June! The other game I’m anticipating is Super Street Fighter IV. I’m usually not one to buy those fighting games, but I was sold on one of the new characters, Hakan. Hakan is an oil wrestler from Turkey, who from what I know is looking to make the best olive oil on the planet, and he loves his daughters, “They are so pretty!”. I highly recommend all of you readers to look up his trailer if you haven’t seen it. If anything is going to sell you on that game, it’s him (if you share my sense of humor, anyway). His special attacks are ridiculous and hilarious! I’ll even go a step further and provide a link to you tube: http://www.youtube.com/watch?v=mK3oMkNvQrI No excuses!